Founded in 1771 as Martinsborough, the seat of Pitt County changed its name to Greenesville 15 years later in honor of Revolutionary War hero Nathaniel Greene. Its name later shortened to Greenville, the town emerged as a regional cotton trading center due to its location on the Tar River. When tobacco supplanted cotton as the region’s primary cash crop, Greenville became a trading and warehousing center for the profitable leaf. Despite its economic role, Greenville did not develop into a major city. By 1910, its population was only 4,000 people. Another sign of Greenville’s minor status was its relative paucity of Jews. Greenville did not develop a Jewish community in the 19th or early 20th centuries. In 1916, unlike many other Southern towns, Jewish-owned dry goods or clothing stores did not line the streets of Greenville. A few Jews settled in Greenville during this period, though none stayed for very long. By 1916, Charles Baker, who had emigrated from Russia in 1898, owned the Electric Shoe Shop, a shoe repair business in Greenville. He and his wife Esther and their children had lived in Massachusetts for several years before moving to North Carolina sometime after 1912. Their tenure in Greenville seems to have been relatively short; by the time of 1930 census, they no longer lived in North Carolina. It was not until 1936 that a lasting Jewish-owned business was established in Greenville. The Brody family, who owned department stores in Sumter, South Carolina and Kinston, North Carolina, opened a ladies specialty shop in Greenville. Morris Brody came to town to run the business. During World War II, the six Brody brothers served in the military, and their sister Ruth Brody Greenberg ran the Greenville store. After the war, Morris returned to take over the business. In 1966, Morris Brody opened a second store in Greenville in a suburban shopping center. In 1986, the family closed the downtown location and opened a store in the East Carolina Mall. By now, the stores were run by Morris Brody and his son Hyman Later, Hyman Brody sold the stores, concentrating on his real estate business. The Brody family, who owned several stores across the state, had a significant impact on Greenville and helped lay the foundation for a local Jewish community. During the 1960s, the small local teacher’s college grew into East Carolina University, a major public university that had over 27,000 students in 2009. The Brody family supported this growth through their philanthropy. They were especially generous to the medical school. In the 1960s, they gave a $200,000 seed grant to help establish a medical school at ECU. In 1979, the Brody Brothers Foundation gave $1.5 million to help construct a facility to house the school. They later gave millions of dollars to support medical student scholarships. By 1999, the Brody family had given over $22 million to support the ECU Medical School, which was renamed the Brody School of Medicine. As Greenville grew, with its population almost doubling between 1960 and 2000, the Jewish community grew as well. The rise of East Carolina University and its medical school along with a growing manufacturing base attracted Jewish professionals to Greenville. Originally, the small group of Greenville Jews, most of whom were from the northeast, would travel to nearby Kinston, where there was a Reform congregation. In 1977, desiring a more traditional style of worship and a congregation closer to home, four Greenville families founded Bayt Shalom, Greenville’s first Jewish congregation. From its beginning, Bayt Shalom was Conservative, affiliated with the United Synagogue of Conservative Judaism. These founders reflected the new economic developments that were attracting Jews to Greenville. Les and Roz Fuchs owned a textile manufacturing company, while Ed and Harriet Lieberman were affiliated with East Carolina University. Joe Gantz owned Empire Brushes, another local manufacturing company. Initially, the congregation met in private homes, and later in a local church. By 1980, the group had bought a small house which they converted into a synagogue. The congregation soon outgrew the house, especially when Jewish students from ECU would come for High Holiday services. As a result, they began holding High Holiday services at the First Presbyterian Church. 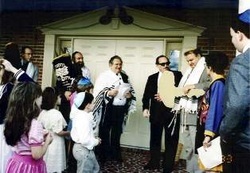 In 1993, the congregation moved to a larger house, which is still Bayt Shalom’s home today. Founding member Paula Blumenfeld designed the stained glass doors that decorate the ark. Despite their small size, Bayt Shalom has had rabbinic leadership since 1985. In 1989, they hired Rabbi Michael Cain, who led the congregation for the next 18 years. During Rabbi Cain’s tenure, Bayt Shalom experienced tremendous growth, doubling from 30 member families to almost 60. During his early years, Rabbi Cain would travel to the congregation in Rocky Mount once a month to lead services. In 2009, Bayt Shalom made history when they hired Alysa Stanton, the first African American to be ordained as a rabbi, to be their spiritual leader. Rabbi Stanton was ordained by the Reform seminary Hebrew Union College, which points to the trans-denominational nature of Bayt Shalom. Indeed, Bayt Shalom is one of the few congregations to belong to both the Reform and Conservative movements. Bayt Shalom’s diverse membership runs the gamut of Jewish practice, from traditional to Reform, and congregants have always had to make compromises with each other on questions of religious ritual. While they still use a Conservative prayer book during services, there has been a recent movement toward more Reform liturgy. These changes along with the tenure of Rabbi Stanton reflect an effort to attract younger members to the congregation. As Jews settled in Greenville, much of the larger community had little experience or knowledge of Judaism. Nevertheless, the founding of Bayt Shalom enabled Greenville Jews to fit into the local church-going culture. The members of Bayt Shalom have worked to build interfaith bridges with the larger community. In 2002, Bayt Shalom was one of the founders of the Interfaith Alliance of Eastern Carolina, which holds interfaith Thanksgiving services, prayers for peace, and discussion groups. In 2009, over 60 families belonged to Bayt Shalom. Many of these were young families with children as the congregation had 30 students in its religious school. In recent years, the congregation’s membership has been stable and slowly growing. The presence of ECU and the local medical center has ensured the vitality of Bayt Shalom. Greenville’s relatively new Jewish community reflects the larger trends of Southern Jewry, in which professionals, often Northern-born, have replaced the traditional retail merchant.